In this lively and humorous account, John Lee guides us through his journey on becoming an addictive bird watcher, starting gently enough with visiting bird reserves on the Suffolk coast with his brother and parents to look for rarities. But then this interest swiftly evolved into a full-blown passion, a passion that survived a spell at university, service in the Royal Hong Kong Police, and even very nearly ruined early romantic encounters with his wife-to-be, Victoria. ...The other good news was that the Solitary Sandpiper was still at Porthellick on Scilly. One more day and we were in. I had that familiar feeling of nervous anticipation before flying over, but this time we were not disappointed. We had a great first day, easily picking up the sandpiper and then finding a Red-breasted Flycatcher in Holy Vale. 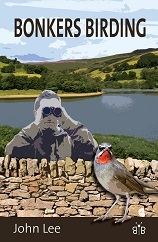 Suddenly, news broke of an Arctic Warbler on the Garrison. ...Having been out in Hong Kong for just under two years, a mate of mine, Dave Stanfield, suggested that we go out to Nepal to do some trekking. It was not primarily a birding trip but there was obviously a lot of opportunities to add to the list. This was a holiday that completely did not go to plan. The whole experience was quite weird, and I had one of the scariest moments of my life there.